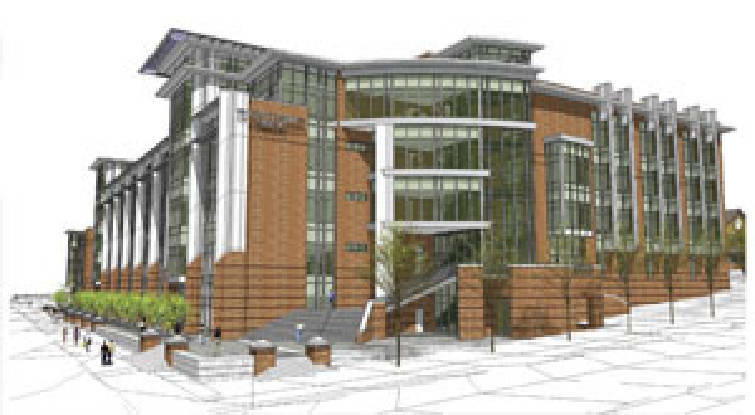 NASHVILLE - Work on UTC's five-story, 180,000-square-foot new library is expected to be completed in less than two years now that the building has been given final approval to proceed, university officials say. State Building Commission members awarded a $37.2 million construction contract to Knoxville-based Rentenbach Constructors Inc. The company won a competitive bid process to erect the building University of Tennessee at Chattanooga officials believe will become a "signature feature" on campus. University officials hope construction can start in four weeks once the actual contract gets signed. UTC Vice Chancellor for Finance and Operations Richard Brown said a library "is at the core of the academic program for any campus." "Our Lupton Library was built more than 30 years ago and has outgrown its efficiency in both space and technology," Brown said. "This new library will allow us to add the necessary space and install the technology required to meet the 21st century academic and research needs of our students and faculty." The new library is being built at the corner of Vine and Douglas streets, now occupied by parking lots. It will anchor the northwest corner of a future academic quadrangle organized around the old Chamberlain Field football stadium. Besides first-floor space for traditional book collections, the library includes a 200-seat auditorium/lecture hall and a second-floor cafe for students and faculty. The third floor will have an information commons that includes a 150-seat computer area, and study rooms will be on the fourth floor. The fifth floor will include special collections and what's being called a "grand reading room." The UT system's director of facilities planning, George Criss, said "we think construction will probably take about 22 months." Calling the facility a "complex project," Criss said "we wanted to make sure we got it right so we spent a lot of time programming it and a considerable amount of time designing it." Some of the labor on the overall $48 million project has already been done. That includes $5.1 million worth of work on architectural, foundation, utilities and other items. The university anticipates spending some $3.8 million on furnishings. Before awarding the construction contract, officials used a bid process that Criss said is intended to "ensure, hopefully, that you're getting the best value for your money." Four companies, including Rentenbach, which has a Chattanooga office, competed for the project. According to State Building Commission documents, Rentenbach narrowly lost by just a half point on its technical proposal evaluation and score to another firm. But the Knoxville builders more than made up for it by being substantially under cost of all the other bidders. In the past, UTC's efforts to secure funding have placed the university on a state-government roller coaster. Hopes of getting it included in the 2007-08 budget were initially dashed when other projects championed by then-Gov. Phil Bredesen, a Democrat, bumped it off a higher education project list. Under bipartisan pressure from Hamilton County lawmakers, Bredesen finally agreed to find funding. Then, when the recession struck in 2009, Bredesen's plan to fund the project through bonds instead of cash drew opposition from top Senate Republican leaders, including Speaker Ron Ramsey. At that point it looked like the project would be scratched off the state list. But Republican and Democratic Hamilton County lawmakers successfully pressed for the bonds.